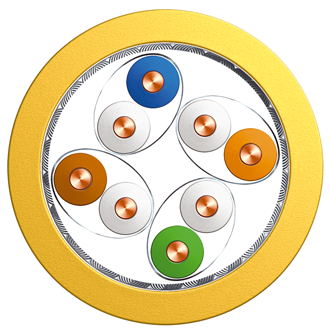 SureLAN® Cat7.A 22/1awg SU/FTP LSZH | Belcom Cables Ltd.
Data cable for analogue and digital signal transmission in the frequency range up to 1500 MHz. It is dsigned for primary (campus), secondary (riser) and tertiary (horizontal) wiring. Use : IEEE 802.3; 10/100/1000/10GBase-T; FDDI, broadband, video, ISDN, ATM, Multimedia, PoE.